As temperatures begin to plummet, it is time to finally admit Summer has come to an end. Unfortunately, this meant it was time for us to say goodbye to our summer interns. Jack Stokley and Shaun Price have played a lively role in the office in the last few months, and will be sorely missed! So before they left I caught up with them to discuss what they got up to this summer, and how they found the Partner Electronics experience. 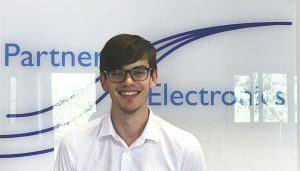 What has your overall electronics placement experience been this summer? JS: I’ve had a really good time! 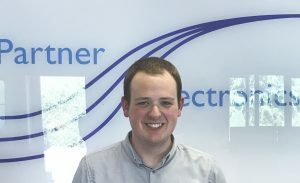 My placement has given me a fantastic opportunity to build some real experience in a number of different areas. I’ll be heading back to Uni having gained a lot of new knowledge and also consolidating previous theory I have learnt. SP: I am coming away from my placement with so much more knowledge and experience than when I started. Getting hands-on practical experience is so useful as it really sticks in my mind. What sort of work have you been able to get involved in? SP: We’ve been super lucky, as we’re not limited to one specific area of electronics. I have been able to dip my toes into several different disciplines. From pure software to pure hardware projects and everything in-between. JS: I’ve done an awful lot of work with Linux, and have also experienced a lot of general programming in C and python. I was also able to get involved in some soldering and circuit modification. So you’ve had the opportunity to work on a range of different projects? JS: Absolutely! one of the best things about interning at PEL is that you get to experience such a wide range of electronics. What have you enjoyed most about your time at PEL? SP: I’ve really enjoyed getting an insight into how a real electronics firm works, and how they deal with projects and actual client work. It’s the type of thing they don’t tell you about at uni, so it has been interesting to get a glimpse of the real world. JS: The fact I took up this position to get practical experience, and now looking back over the past 12 weeks and I’ve managed to get tonnes of it is really satisfying. Aside from that, getting a real insight into the process employed in real engineering work has been really interesting. I am definitely coming away with a more detailed image of what a career in engineering would look like. Did you have any goals you hoped to achieve over the placement? SP: My main goal at the start of the placement was to narrow down the fields I wanted to specialise in. Over my 12 weeks here I’ve had the opportunity to experience a wide range of projects, and now I know I want to explore hardware further in the future. JS: In my previous placements I’ve been in customer support roles or sales, so I was really keen to get some practical experience. Performing tasks such as soldering, making circuits and programming on real jobs for clients has definitely helped me to get this experience. Has the electronics placement experience helped you to progress as an engineer? JS: The internship has certainly helped me progress as an engineer. I had never followed a whole project from start to finish before, aside from small DIY ones I work on in my spare time – so I have to say this experience has really helped me to develop. SP: 100%! I’m definitely the type of person who learns via action. The practical experience has taught me things I had never even considered in education, you get such a different perspective in the field. SP: So I’m heading back to London where I’ve got another year at Imperial to finish off my degree. This summer has definitely confirmed my belief that my interests lie in hardware – so I want to pursue that in the future. JS: I still have 2 years left at Uni, so my plan is to go back and make the most of my last couple of years. I am 100% going to look for another placement next summer though. I believe they’re ridiculously useful in helping to work out what type of career you want. Would you recommend a placement to fellow students? JS: Absolutely! When I get back to Uni I’m giving a presentation to freshers on how great placements are! I think they’re crazy valuable for getting an idea of the work you enjoy, and ultimately help you to find a career you’re going to find rewarding. If you’re interested in following in Jack and Shaun’s footsteps check out our Careers Page and Gradcracker Hub. The Place To Be: South Northamptonshire. Get That Graduate Electronics Club.